The Edwardian Votes for Women campaign was everywhere. It spread out into every town; it walked down every street; it entered every home; it was discussed – and argued over – across kitchen and dining room up and down the land. It encompassed the courageous suffragettes, whose militant action often landed them in prison to endure hunger strikes and even forcible feedings. And it embraced those self-effacing suffragists who so dreaded public speaking; their constitutional campaign had them mounting soap-boxes in market squares and even taking their suffrage caravan out into the remotest dale, the most sea-swept fishing harbour. It included those whose own brave rebellions went quietly unrecorded: arguments with fathers, whose political loyalties or patriarchal certainties blinded them to their daughters’ undemocratic lack of vote. This book is written to honour all those Edwardian campaigners whose small acts of enormous courage so often went uncelebrated. 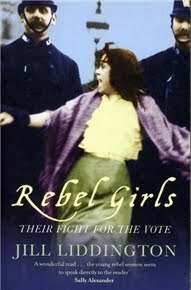 Rebel Girls is a group biography of several suffrage activists who have mostly been left out of the spotlight before: Adela Pankhurst, far less well known than her mother Emmeline or her sisters Sylvia and Christabel; Dora Thewlis, referred to by the contemporary press as “baby suffragette” following her imprisonment at the age of sixteen (portrayed in the cover) – a pet name which, then as now, was used to infantilise her and deny her agency; Lilian Lenton, who swore to burn down two buildings a week until women were given the vote; Lavena Saltonstall, whose excellent writing is only just being rediscovered; Florence Lockwood, Bloomsbury bohemian painter turned Yorkshire woman; and also Mary Gawthorpe, Mary Murdoch, Edith Key, Isabella Ford, Leonora Cohen and Molly Morris. The subjects chosen by Jill Liddington were women from Yorkshire rather than from the most well-known centres of the suffrage campaign. Furthermore, many of them were working class women – factory workers, weavers, millers, and tailoresses – whose stories challenge the myth that first wave feminism was exclusively an upper middle class affair. Obviously this isn’t to say that class-based critiques of early feminism are misplaced, but as is often the case, these critiques don’t tell the whole story. There were working woman involved in the suffrage movement too, and their role was as crucial as that of their more celebrated peers. Of course, the fact that their contributions were forgotten is worth noting in itself, but thankfully modern historians such as Liddington have attempted to redress the balance. Should any girl show a tendency to politics, or to ideas of her own, she is looked upon by the majority of women as a person who neglects doorsteps and home matters, and is therefore not fit to associate with their respectable daughters and sisters. If girls develop any craving for a different life or wider ideas, their mothers fear that they are going to become Socialists or Suffragettes – a Socialist being a person with lax views about other people’s watches and purses, and other people’s husbands or wives, and a Sufraggette a person whose house is always untidy. If their daughters show any signs of a craving for higher things than cleaning brass fenders or bath taps, they put a stop to what they call “high notions”. Who is going to tell these mothers that daughters were not given to them merely to dress and domesticate? Who is going to tell them that they have a higher duty to perform to them than merely teaching them housework? Who is going to tell them that it is as cruel to discourage a child from making use of its own talent or individuality as it would be to discourage a child from using its limbs? Saltonstall’s writing reminded me of a point Aarti once made about how awareness of the limitations of gender roles and resentment of these injustices were really not that exceptional in the past. At any given time there were women very well aware of the inequality and unfairness that surrounded them. Unfortunately, there are all sorts of issues surrounding how historical fiction portrays this, which often come down to what we perceive as accurate. Novels whose protagonists are excepto-girls (the only character in the book to show any sort of awareness at all) are reductive of the complexities of history, irritating to read, and problematic in all sorts of ways; yet historical novels where a large number of women express proto-feminist sentiments are often dismissed by readers as anachronistic. This is why books like Rebel Girls matter so much – they add depth and nuance to our concept of an era. We find ourselves in agreement with his Honour when he says that girls of seventeen [sixteen] ought to be at school. But we respectfully remind his Honour that girls of Dora’s age in her station of life are in this part of Christian England compelled [in their] thousands to spend ten hours per day in health-destroying factories, and the conditions and regulations under which they toil for others’ gain are sanctioned by law in the making of which women have no voice. Go Mr and Mrs Thewlis! How awesome do they sound? At the end of Rebel Girls, Jill Liddington included an appendix about her research, which she calls her “suffragette sleuthing”. She describes how she used unpublished or out of print diaries and memoirs; personal papers and correspondence often found in attics by the subjects’ grandchildren and dutifully donated to local archives; period newspapers; and the results of the 1901 census, which were only made publicly available in 2001. All of these sources allowed her to pierce together the stories of a group of women who had been mostly written of history. All of this was very exciting to read for someone like me, who has worked as an archivist and would happily do so again. What interested me the most, though, were Liddington’s reflections on how what we currently know of the history of the suffrage movement was (re)written and crystallized in its current shape. Sylvia Pankhurst’s The Suffragette Movement, for example, is only one side of the story, and yet it became canonical and is frequently perceived as an all-encompassing account. This is a fascinating if slightly troubling process, and it put me in mind of what Lucasta Miller describes in The Brontë Myth. Mythmaking and history are often if not always indissociable processes - we can only be glad of the glimpses we get of the unwritten side of the story. Many thanks to Violet for recommending this book to me. I'm so glad you reviewed this book, and that I saw this review. This is a "go out and get it right now" kind of book. I love the quotes you included. What brave women. Wow another fantastic recommendation Ana! Thanks! And I agree, those parents are pretty awesome. This is a subject that I have not read widely on, but this book sounds like it would be a perfect introduction. I am glad that you liked it and that it was so edifying for you. I am adding this one to my list. I have so much admiration for those trailblazers. The cover of this book is fantastic! THANK YOU. I am so glad more books are coming to the surface now about how not all women were sitting around twiddling their thumbs and pretending that they loved corsets through most of history. Sometimes the history people make up is more relevant than real history! I'm fascinated by Liddington's point that the notion of first-wave feminism being restricted to the middle and upper classes is perhaps inaccurate or at least reductive. It's certainly a criticism one hears a lot, so it would be fascinating to read about the working-class folks involved in the movement. And that letter from Mr. and Mrs. Thewlis! What amazing parents! Sounds wonderful! I have this absurd giggly reaction to any mention of the Pankhursts, because Elizabeth Peters mentions them occasionally in the Amelia Peabody books. Not in an incredibly flattering way. And now that is all I can think of when I see their names. Oh! This sounds SO GOOD. I cannot resist feisty letter-writers such as the Thewlises. And I agree, I was interested to hear how passionate and committed (and crazy - burning down two buildings a week?!) the British suffragettes were compared to the American movement...but I suppose once British women had the vote it was easier for ladies over here to win their point. Awesome review, Ana! This looks like a wonderful book! Everytime I read about something like this, I am amazed at how many unknown people fought for every little right and freedom which we take today for granted. I loved what Mr. and Mrs.Thewlis said :) When I read your review I remembered a play I read many years back called 'The Winslow Boy' by Terence Rattigan. It had an interesting character called Catherine who was a suffragette. I also find it frustrating when I see people giving up their freedom so easily today - freedom for which others have fought for years in a bygone era. I remember a time when I used to fight with my dad for getting an inch of freedom for my mom and when I was away for a while and came back, things were back to 'normal'. When I asked my mom then on why things had gone back, she used to say that it was okay. Sometimes I got angry with her and said that it was not okay, because we had fought for that 'inch' of freedom and she had struggled for years to get there. When I see women from my own generation doing the same things - giving up freedom for financial security or for a few concessions - I feel extremely sad, because that is the way the patriarchial world has kept women in line for millenia and the old ways were at work and people weren't realizing it. I liked your observation that the stories in the book "challenge the myth that first wave feminism was exclusively an upper middle class affair." This "upper middle class" thing - I get annoyed at it whenever I read about it and think about it. I don't know why the "upper middle class" is the most important part of the population and why it is supposed to wield the most influence in every aspect of life. And I am extremely annoyed when people keep propagating this myth. I read somewhere that "all knowledge is socially constructed by those in power - lacking any basis in true reality - and should be challenged for the sake of the powerless". It looks a little extreme, but there seems to be a point here, when we look at the way the many unknown heroines have been ignored in the suffragette movement. Very interesting sounding work that looks like it widens the picture of what feminism is and where it comes from. I would love to see something scholarly that deconstructs the ideas behind feminism being first concerned with the upper middle classes. I'd expect there to be a lot of conflicting stuff there leading to the same result (classist pride, class criticism, bashing of feminism as a frivilous upper middle endeavour...) but I'd love to actually KNOW. This sounds like a wonderful book, with the voices of so many not heard before. This sounds like a really great book. I remember reading about the suffragette movement in all its different forms in feminism classes and political science classes. But I also couldn't help thinking that as much as we learn about any era of history or person in history, there are always viewpoints left unheard. Its great when those viewpoints come to light but I think that it is also important to challenge every viewpoint. This is definitely going on my list. I would love to read these previously unheard voices. I read this earlier this year and found it fascinating particularly as my great-grandmothers and their sisters were living and working in the towns she talks about. I have no idea if they were involved in the fight for the vote but this book really made me think about it. I love your paragraph about how historical fiction often assumes that most women were blind to their unfair lot. Books of historical fiction may be considered 'feminist' for having an excepto-girl heroine, but if that is done by making almost all other women look pathetic, is it really that empowering? I like how Laurie R. King has a strong, intelligent heroine in her Mary Russell mystery series, and yet also populates the plots and background with other intelligent, delightful women. I think of one passage in O Jerusalem, where some expatriate men and women separate after dinner and the men dismissively say that the women are going to talk about 'frivolous' things, but instead the women start earnestly discussing the political situation in the Middle East at that time. Also, that sounds great how the book uses primary sources so well.